He is one of the kindest, most humble, knowledgeable, and listening doctors I have ever met. -Melissa T.
After going to several other doctors for years, he is the only one who was able to get me to complete pain management relief. -Valerie S.
Dr. Wesley Ibazebo is an expert interventional spinal care specialist and is experienced with a wide array of non-surgical diagnostics and treatment for orthopaedic conditions. He provides care for degenerative disorders of the musculoskelatal system as well as treatment for injuries and trauma to bones, nerves, tendons, ligaments and muscles. Dr. Ibazebo is a trusted physician with Murphy Wainer Orthopaedic Specialists in Greensboro, NC serving patients throughout the Piedmont Triad area. Injections and blocks, including fluoroscopic joint injections. Non-surgical treatments for injuries and illnesses that affect how you move. Helping to accurately diagnose conditions and treatments for nerve issues. RFA deactivates nerves with a heat probe to alleviate pain. 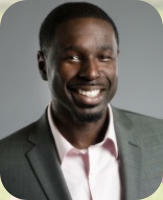 Dr. Wesley Ibazebo is an expert interventional spinal care specialist and is experienced with a wide array of non- surgical diagnostics and treatment for orthopaedic conditions. He provides care for degenerative disorders of the musculoskelatal system as well as treatment for injuries and trauma to bones, nerves, tendons, ligaments and muscles. 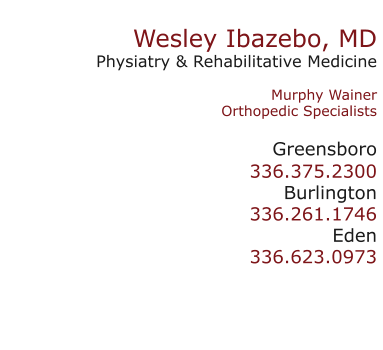 Dr. Ibazebo is a trusted physician with Murphy Wainer Orthopaedic Specialists in Greensboro, NC serving patients throughout the Piedmont Triad area.